Donating funds to GEN is a tangible way to contribute to this concrete and dynamic movement for positive change. Your donation helps to support and to spread ecovillages around the world. We invite donations to GEN International or a GEN Region. Subscribe to our monthly Newsletter to keep up to date with the latest news and happenings in ecovillages and their allies around the globe. You can also subscribe to your region's newsletter for local updates! Volunteering supports the network while forming valuable connections, meeting incredible people, and contributing to a positive future. There are many ways you can support GEN with your time and energy. 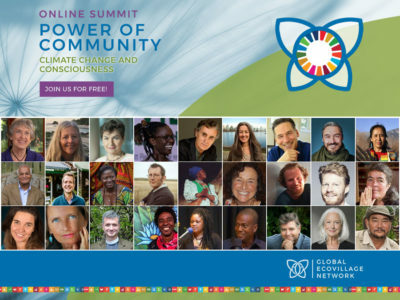 The Global Ecovillage Network envisions a world of empowered people and communities, designing pathways to a sustainable future, while building bridges of hope and international solidarity. As a solution-based, multi-stakeholder alliance, GEN provides information, tools, examples, and representation to the expanding global network dedicated to demonstrating principles and practices of sustainability in their lifestyles and communities. The Global Ecovillage Network is a registered charity: SC043796 and has consultative status in the UN – ECOSOC.